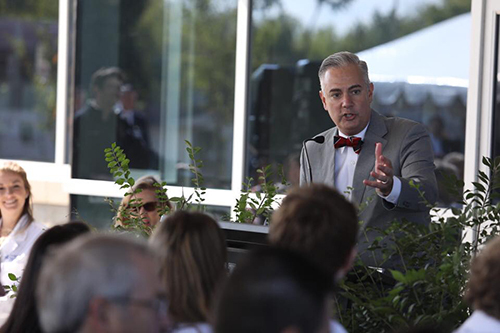 WKU President Timothy C. Caboni spoke at the Oct. 11 ribbon cutting ceremony for the University of Kentucky College of Medicine-Bowling Green Campus, a partnership between Med Center Health, UK and WKU. Training physicians in Kentucky for Kentucky. That’s the mission of the UK College of Medicine-Bowling Green Campus. WKU's Amy Bingham has more on the role WKU plays in this important partnership in this week’s View from the Hill. A ribbon cutting ceremony on Thursday (Oct. 11) marked the official opening of the University of Kentucky College of Medicine-Bowling Green Campus. The celebration of the new home for faculty, staff and the inaugural class of 30 students was also an opportunity to thank the medical school's partners -- Med Center Health and WKU -- and the community of Bowling Green.